Home / Model Supplies / Adhesives / Aliphatic Resins | PVA / SIG-BOND, 2 oz. 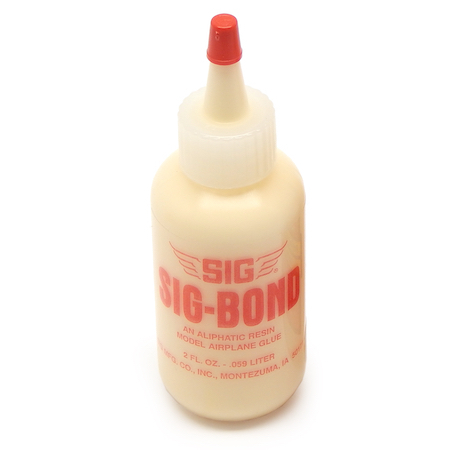 SIG-BOND is an aliphatic resin model airplane glue that makes model building easy! It’s the traditional general purpose wood glue that model builders have loved for years because it is so safe and easy to use. Non-toxic. Cleans up with water. This glue is super strong and will permanently bond all types of wood. The joint will undoubtably be stronger than the wood itself! Recommended for the assembly of all the wood parts of a model structure. Air dries in 20-30 minutes and sands very well. Completely dope and lacquer proof. Type Aliphatic Resin | Color Cream | Volume 2.0 oz.